Political groups in Pakistan's Balochistan province have called a three-day general strike in protest at the killing of three ethnic leaders. 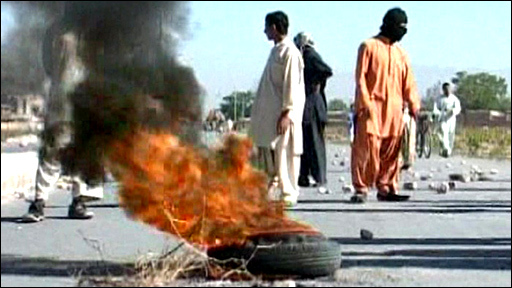 The United Nations expressed "serious concern" over the killings and urged an immediate investigation. Supporters say the three men went missing after being detained by security forces. An army spokesman blamed "anti-state elements". The BBC's Barbara Plett in Islamabad says the discovery of the bodies has torn the lid off a simmering conflict. Baloch nationalists have long campaigned for greater autonomy and control of local resources. An armed insurgency is demanding outright independence. A statement by Michele Montas, spokeswoman for the UN secretary general, read: "The United Nations calls on the government of Pakistan to immediately investigate these murders and to ensure that the Balochistan Qaum Dost Committee continues its important work." The BBC's M Ilyas Khan in Islamabad says the statement by the army spokesman is highly unusual. It terms the murders "regrettable" and blames "anti state elements... out to destabilise and undermine the reconciliatory efforts of the government". The spokesman said it was "unfortunate and not in the interest of the country to make serious allegations against security agencies without knowing the facts and evidence". Our correspondent says the army's internal intelligence wing, the Military Intelligence, is widely held responsible by many people in Balochistan for "disappearances" of political activists this century. 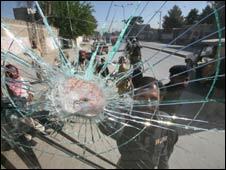 On Thursday a policeman was killed by protesters' gunfire in the town of Khuzdar.